Contagion is a harrowing thriller about a killer virus that spreads across the world and how Academy Award nominees and winners deal with this epidemic. The virus, MEV-1, especially has it out for Best Actress winners. The trailer already gives away that Gwyneth Paltrow (Best Actress 1998 - Shakespeare in Love) and Kate Winslet (Best Actress 2008 - The Reader) contract MEV-1. Natalie Portman, Halle Berry, and Sandra Bullock were wise not to sign on for Contagion, lest they also find themselves wrapped in a plastic sack and dumped in a mass grave. No mercy to Best Actresses! Marion Cotillard (Best Actress 2007 - La Vie en Rose) escapes MEV-1's wrath only because she gets kidnapped in China and held as a hostage in exchange for a cure. Cotillard, who will play Talia Al-Ghul in The Dark Knight Rises, was abducted by Chin Han, who played Lau in The Dark Knight. (Batman did not return to China to save her. He was wise to stay in the Batcave until the epidemic blows over.) The MEV-1 virus spreads quickly and cruelly over 180+ days, upending the holiday plans of such movie stars as CDC head Laurence Fishburne, father and husband to Paltrow Matt Damon, and opportunistic, muck-raking blogger Jude Law. Law plays a real scumbag here, using the tragedy of the virus for his own personal gain. Contagion details the spread of the fictional (it better be!) MEV-1 virus, which is described as "the bird flu... already weaponized [by birds]" and is contracted person to person like the common cold. MEV-1 has no known cure and it's up to the CDC to find one. Meanwhile, MEV-1 gradually kills over 26 million people worldwide. 26 million! This is terrible. Beyond terrible. Those surviving the virus, including Damon, who is naturally immune, are left wandering their wrecked, quarantined towns as looters riot, set fire to buildings, and commit home invasions. Contagion's climactic explanation of where MEV-1 came from puts a real damper on my next visit to a casino and a high end Chinese restaurant. While slickly and colorfully made, the overreaching question is "Why?" Why make Contagion at all? What do we learn? What is the point? Contagion says, "All this terrible stuff is what would really happen if a killer virus ravaged the world." How does one react except: "Great. Thanks. Thanks for showing us this." 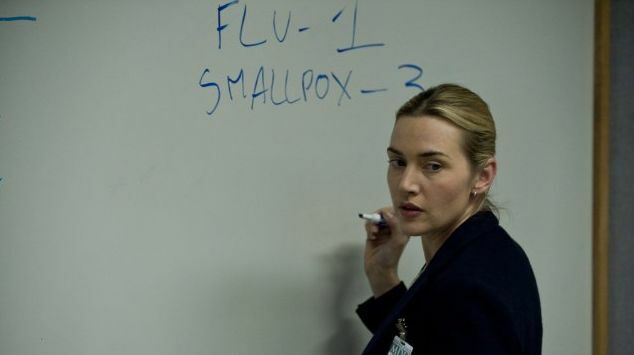 On the plus side, Contagion lets us hear Kate Winslet's American accent once more. Director Steven Soderbergh does go gonzo with a shot of Gwyneth Paltrow's corpse undergoing an autopsy that is the biggest howler in the movie, with a moment involving Gwyneth's head going graphically far beyond her head in a box in Se7en. Thanks. Thanks for showing us this. I found the most implausible aspect of the film to be a teenage girl in 2011 selecting a U2 song from 1988 as the first song at her "prom." I didn't see too many teenaged girls at the last U2 concert I attended. That was the best moment, besides Gwyneth's scalping. Clearly, Matt Damon is an excellent father who raised his daughter properly.